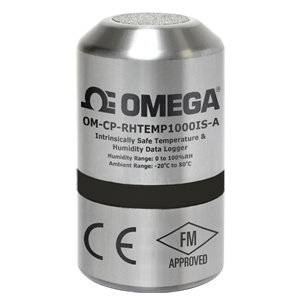 The new OM-CP-RHTEMP1000IS-A is an intrinsically safe temperature and humidity data logger certified for Class I, Division 1, Groups A, B, C, and D and nonincendive for Class I, Division 2 Groups A, B, C, D environments. This certification makes the device ideal for EtO sterilization, environmental studies, medical and pharmaceutical and numerous other hostile environment applications. One of the enhancements to the OM-CP-RHTEMP1000IS-A is the stainless steel enclosure with engraved serial number and device name. The device interfaces with the OM-CP-IFC400 docking station or the OM-CP-IFC406 multiplexer data logger interface (sold separately) and can be placed directly into the dock for full communications. No more removal of end-caps to download data. The small size of the OM-CP-RHTEMP1000IS-A allows it to be placed in remote or hard to reach locations. The device now features a battery life indicator allowing users to easily identify low voltage and change batteries when required. This feature maximizes the use of your battery life and is a cost saving efficiency. The OM-CP-RHTEMP1000IS-A utilizes the latest software. This allows for simple starting, stopping and downloading of collected data. The devices are able to store up to 16,350 time and date stamped humidity and temperature readings in non-volatile solid state memory. Once the readings have been downloaded to the software, it can be viewed in graphic, tabular, and summary form for easy analysis, as well as the potential to be exported into Excel® for further calculations. 注: Comes complete with 3.6V lithium battery. Operator’s manual and USB interface cable are included with the OM-CP-IFC400 software/cable package or OM-CP-IFC406 multiplexer (required for data logger operation), sold separately.